Damaging power surges or lightning strikes can enter your phone system through standard, analog telephone lines from your local dial tone provider. Connections from traditional telephone companies and cable-based providers may be affected. This device is designed to work with a single line telephone phone cord (RJ-11) connection to the Central Office or Line Ports of your XBLUE X16, X25 or X50 system. Simply connect the telephone line to the unit and then connect the unit to your system. A connect to ground is required. Comes with a $50,000 equipment warranty from the product manufacturer. 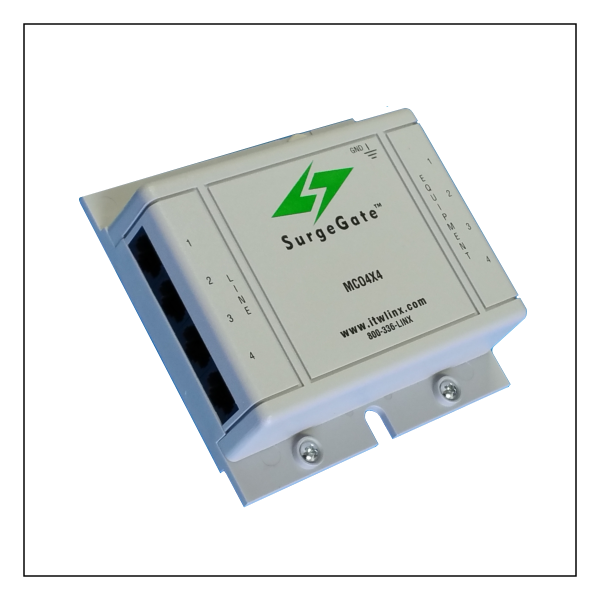 ITW Linx Surge Gate model MCO4X4. More information is available at the ITW Linx website.